The historic town of Zabid is renowned for its domestic architecture and its Islamic university attracting students from far. 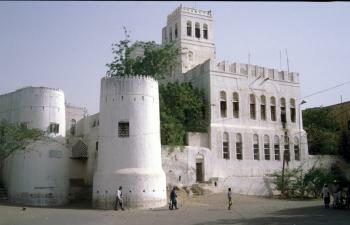 In the 13th to 15th centuries it was also the capital of Yemen. Zabid was established in 631 and further developed in the 8th century with fortifications, the Great Mosque and a network of canals. The current town has 86 mosques, with madrasas attached. 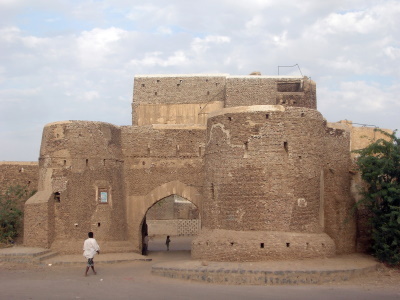 In 2000, Zabid was listed on the List of World Heritage in Danger; the listing was made on the behest of the Yemeni government due to a state of poor upkeep and conservation. According to a UNESCO report, roughly "40% of the city's houses have been replaced by concrete buildings, and other houses and the ancient souk are in a deteriorating state". The West side of Yemen consists of a flat low-lying strip of semi desert called “The Tihama”. This area is hot, hot, hot! Facing Africa, it feels very different from the rest of Yemen. If you go there you will probably overnight in the port of Al-Hudayda and Zabed lies a few miles south. Zabed is one of those WHS which, if it justifies its inscription, does so because of what it has been rather than for what you can see now. From the earliest years of Islam a Koranic university flourished there. It is said that the word “Algebra” (Al-jabr) was coined by a scholar from the town. The very first mosque in Yemen was founded nearby by a local leader who actually visited the Prophet Mohammed in Medina. The old town is surrounded by walls in mixed state of repair. The main entrance is through a medieval gate and inside there is an area of suqs, a few mosques and a “palace” (19th century). Pleasant enough but, in the heat, not anything to get excited about! The centuries of Islamic scholarship do not come across to the casual non-Islamic visitor! We were however invited into a couple of the town houses and these were far more rewarding with their patterned white stucco walls and richly painted ceilings in “Islamic” abstract designs. The colors, though not of course the subject matter, reminded me very much of those on the ceilings of churches and monasteries in nearby Ethiopia – the same rich reds, golds and dark blues which on the other side of the Red Sea were used to produce those rows of smiling “saints”. This brings home the early connections between the 2 sides of the Red Sea – Yemen was on several occasions part of the Axumite empire and was a flourishing Christian and Jewish area before the rise of Islam. As you cross the Tihama you will come across nomads living in circular reed huts – a reminder that Africa is very close! Universities: Zabid was one of the most eminent academic centres of the Islamic world. The vestiges of this university can be visited. Ibn Battuta: "It is a great and populous city, and contains groves of palms, orchards and running streams -- in fact the pleasantest and most beautiful town in al-Yaman."